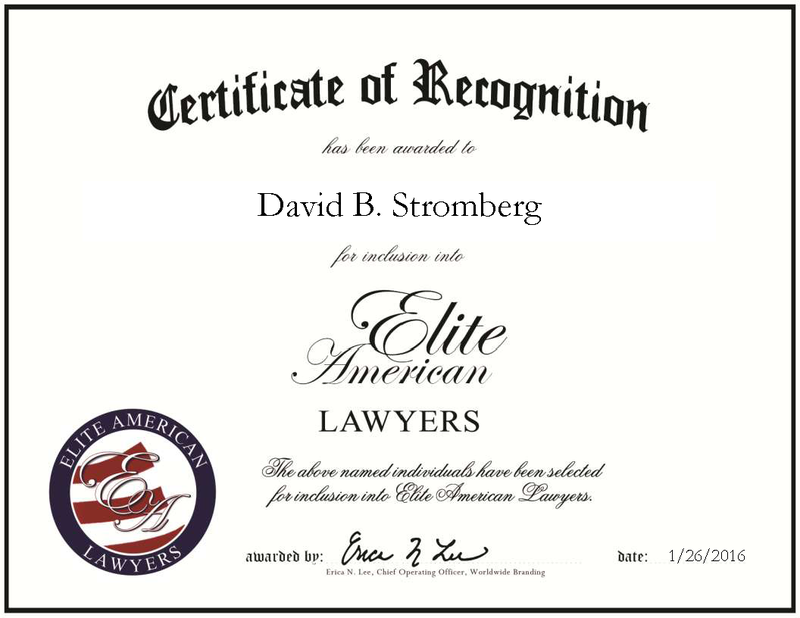 Walnut Creek, CA, January 26, 2016, David B. Stromberg, Attorney and Mediator at Stromberg Law Firm, has been recognized by Elite American Lawyers for dedication, achievement and leadership in mediation and alternative dispute resolution. After an incident in his senior year of high school that ultimately involved the American Civil Liberties Union establishing his right to free speech, Mr. Stromberg decided to pursue a career in law. He proceeded to earn a Bachelor of Arts from Cornell University and a JD from Boston College. Mr. Stromberg is currently a formally trained commercial mediator and an arbitrator who has facilitated dispute resolutions, including mediation, arbitration and neutral evaluations, for more than three decades. His practice, Stromberg Law Firm, offers quality civil litigation, transaction, mediation and alternative dispute resolution services for legal matters and disputes in the areas of real estate, business and corporate, construction and contracts. Mr. Stromberg practices both privately and in conjunction with the Contra Costa Superior Court’s program, the Alameda County Superior Court alternative dispute resolution programs, the Santa Clara Superior Court alternative dispute resolution programs, and the California Court of Appeals for the First Appellate District appellate mediation program. The highlight of his career is his proven track record of successful trial verdicts. Additionally, Mr. Stromberg finds that being able to assist individuals and businesses in resolving disputes is extremely rewarding. He attributes his success to always remembering that the client comes first and foremost. Mr. Stromberg was a member of the board of directors for Family and Community Services of Contra Costa from 1995 to 1996, and he was a trustee for the Lafayette School District Governing Board from 2002 to 2008. He is rated a BV Distinguished Attorney through Martindale-Hubbell, and earned a superb rating from Avvo. In the years to come, Mr. Stromberg aspires to practice mediation on a full-time basis. This entry was posted in Mediation, Uncategorized and tagged alternative dispute resolution, arbitration, BV Distinguished Attorney, mediation, neutral evaluations, Stromberg Law Firm. Bookmark the permalink.